The Winter Series entry form is now available on the notice board or to download from here. Please remember this is first come first served for this popular series. Please include cheque payment with completed form. Please see the notice below for the menu. I need to finalise numbers by Wednesday so that Jo can order/prepare sufficient food to cater for our needs. Pre-ordering with me is recommended to save time on eve as there are over 60 people booked in. Hope to see you at the club this Friday. Complete with a standard rig, XD pack, gunnel hung trolley, rooster foil bag & sail bag. Well maintained & ready to race. Over the past couple of weeks we have been having problems with one of the displacement boats leaking fuel. When it was realised what was happening, three people, Mark Dell, Toby Speller and Peter Thompson set about removing and repairing the fuel tank and then refitting over a few evenings last week, all in time for the weekends 9’er Open Meeting. On behalf of all TBYC members, “Thank you and well done guys”. The Hughes family have lost their Pico centre board. If you have seen it, or borrowed it, could you please let me know. It is marked with the Hughes family name. Downloadable documents (Microsoft Word .doc format). Great weekend’s sailing in 12kt breeze, albeit very shifty making the beats very complex and seeing some “outsiders” coming through the fleet. Jess and Alex finished 6th overall after a reasonably consistent event. Molly and Ben cam 3rd in the Silver fleet and were often in the top 10 at the windward mark. George and Johnny had a comendable 29th place in one race. Again, the chance and experiance of sailing in a huge fleet (75 entries) is a fantastic opportunity for our youngsters. After this consistent weekend, Jess and Alex have qualified 5th out of the 7 boats selected to represent GBR at the coming World Championships to be held in Argentina at Christmas. This is a great achievement and we are all very proud of their success. This will now be Alex’s 3rd World Team selections since being asked to crew for Ollie Herve in Wales. Thanks Ollie!! So now comes the difficult time of raising the funds to send them! If any club member has any ideas or whose company might be able to offer some form of sponsorship I would be very pleased to hear from you. Congratulations to Peter Thompson and Steve Hopper (Sand star) who took the crown of Sandhopper National Champions for the second consecutive year. 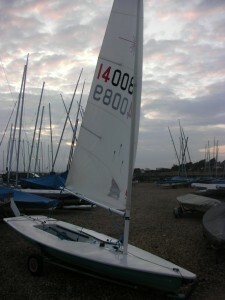 29 boats entered this years event in champagne sailing conditions at TBYC. Sandstar stormed the board with a 2-1-2 to secure top spot. second place was closely contested with Apollo (2nd Eyre & Burrell) just beating Squiffy ( Binnendyke & Saunders) into third. many thanks to Hyde sails who Sponsored the prizes of new sails, the support crews headed by Tony Clarke, the race officer team of Geoff Appleton, Lisa Farrall for organising a great social event and Jo & the crew from the catering team at TBYC who helped make the whole weekend event a tremendous success. Thanks to all who participated in making the event such an enjoyable experience. Over a busy weekend at Whitstable, Kyle won the Saturday Series with one first and two seconds. He then went on to score a third and double points in the Forts Race Tornado medal series race to secure overall victory. A supreme effort by Kyle and Oliver Herve in what was their first ever Tornado national event. None of ther other Tornado sailors had met this all conquering team from Thorpe Bay Yacht Club – but they wont forget them in a hurry either ! Congratulations to David White for winning the F18 series beating a profesional crew from Nacra UK to score a sensational series win with a large fleet of very competative sailors. Nick Elmore and Sam Spratt came second in the mixed fleet to complete a great event. Thorpe Bay Yacht Club was mentioned more than any other at yesterday’s prize giving – certainly an impressive set of results. Congratulations to Barry for organising a very successful championship.